I have a question on the use of court case powders. My question is how to use it in cases that are civil in nature. Most of what I read seemed to imply criminal. My personal situation is disputing property tax values with my city, they have hiked the values up extremely high regardless of real nominal values. I am disputing it to the state and it is being sent to court. I am sending documents to the court and planned to dress them with court case powder. Question- do I still recite psalms 35 for court cases and psalms 37 for the city or would I use psalms 23 in a civil case. Thanks I appreciate all suggestions! Most court cases and legal matters involve civil, not criminal, law. This was even the case in pre-Biblical times, where two people would have a dispute and the tribal elders would make a decision as to which was right. Psalms 35 and 37 would be fine for this situation. Mama Micki is right. Read Psalms 35 especially and you will see how it applies. Also, Court Case Sachet Powders are blended with other powders for various types of lawsuits. • In civil suits where one is hoping for a financial settlement, it is customary to add Pay Me Sachet Powder to the mix. • In criminal cases where one wishes for a defendant to receive a harsh sentence, up to and including the death penalty, powders such as Destruction, Damnation, or D.U.M.E. are blended in. • In child custody cases, King Solomon Wisdom Powders are invariably an adjunct, due to the Bible account at 1 Kings 3:16-28 in which Solomon judged which of two sisters-in-law was the true mother of a disputed baby. 1. is there any spell that force our neighbors to dismiss the case? now , this pending situation just cause mental problems for my family, we don't scare of them, as we revenge if they wanna do anything against us, but we are just under mental pressure. 2. is there any spell if i come back to my country, no one cause me any problem in the airport? in my country, there is no law and order, they can arrest anyone they don't like or feel jealous about him/her , especially in the airport, it happened for many people. These are questions that a psychic has to answer. We cannot give psychic readings on the forum. And, your second question is ESPECIALLY one that I would not want to answer without a reading. I already have done reading, as their reading just was predicting one year, it did not show anything about this issue. Is there any court case powder or incense i can use? 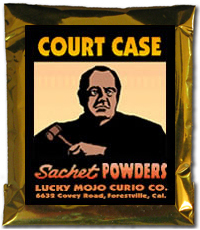 Lucky Mojo does carry Court Case Sachet Powder as well as many fine Court Case Products, including incense, that you can work with for your situation. You've been given excellent advice. The court case products are great for this type of thing. Papa Newt has given you the links to them. Ask for the court case candle. You might also consider the influencing products. Go to the thread on Influencing oils, sachets, incense. To influence the main person in their family to leave you and your family alone. If it were me, I'd go back and get a reading & a magical coaching session. This way, your reader/rootworker can focus again on the issue and prescribe to you what products to use and how to use them. The reason you've been given advice for getting a reading is because you need to make sure the reader focuses on the issues you mentioned here. You spoke of many different situations; the theft, the harsh jail sentence you've received if you go back and the mental anguish these horrible people have caused you and your family. On a practical level. If you've been given a jail sentence in a country that you have described as having no law and order, wait until things settle down. You said they even arrest people in the airport. If you know these things, stay away until the atmosphere calms down. Get another reading and be clear about what you need from the reader. Ask for a magical coaching session. Write down what they tell you to do. Do it. Be sure you understand what the reader is prescribing to you. There may be a language barrier so be absolutely certain you understand what they advise you to do. Write down the questions you have for the reader. Be specific. It is important that they understand what is going on so they can serve you better. Ask them also how to best protect yourself magically. If I don't understand someone because of a language barrier, I ask and ask them again until I understand. Squeaky wheel gets the grease, is what my Grandmother used to say. Ask, ask, ask until you get what you need to break through this mess. Just go this this page and browse through all the root workers' specialties.